(Irving, TX) - May is National Bike Month and with warmer weather luring a growing number of bicyclists onto roadways, AAA Texas encourages both bicyclists and motorists to make safety a top priority. While most adults ride bikes recreationally, an increasing number are riding their bike to work, to improve their health, save money and reduce their overall carbon footprint. But with the freedom and fun of the bicycle must also come a shared responsibility between bicyclists and drivers. More than half a million collisions occur between motor vehicles and bicycles happen every year in the United States. Hundreds of cyclists are killed in those crashes and tens of thousands more are injured. Many of these incidents are the result of motorists’ failure to properly yield to bicyclists. Always ride with traffic, using the rightmost lane, obeying the same laws as motorists. Use hand and arm signals to indicate your intention to stop, merge or turn. Ride where drivers can see you. Do not ride on the sidewalk. Wear brightly colored clothing at all times. At night, use a white front light and red rear light or reflector, and wear reflective clothing. Always be aware of traffic around you and be prepared to take evasive action, exercising additional caution at intersections. Helmets, when worn properly, are up to 85 percent effective in protecting the head and brain in the event of a crash. Should you crash, or have an impact that affects your helmet, replace it immediately. Fit matters: Wear your helmet level on your head, low on your forehead, with no more than two finger widths above your eyebrow. Stay alert, avoiding all distractions while driving. Yield to bicyclists when turning. Check mirrors and blind spots for bicyclists before entering or leaving a lane of traffic. Slow down and give at least 3 feet of clearance when passing. In bad weather, give bicyclists extra passing room. 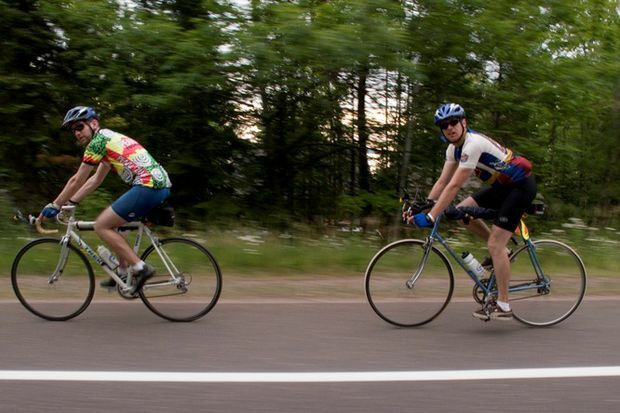 Reduce your speed when passing bicyclists, especially when the road is narrow. NEVER honk your horn at a bicyclist just to let them know you are there; it could cause them to swerve into traffic or off the roadway and crash. Save your horn for emergencies. Always check for bicyclists before opening your car door. For information on bicycle safety, please visit SharetheRoad.AAA.com.